The time is finally here, AMD has launched a game changing CPU with incredible leaps in performance compared to their previous FX CPU line. 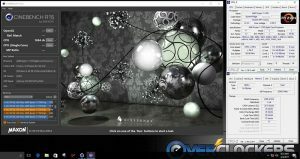 My intention here is to aid you in leveraging just a bit more out of the AMD Ryzen CPU. 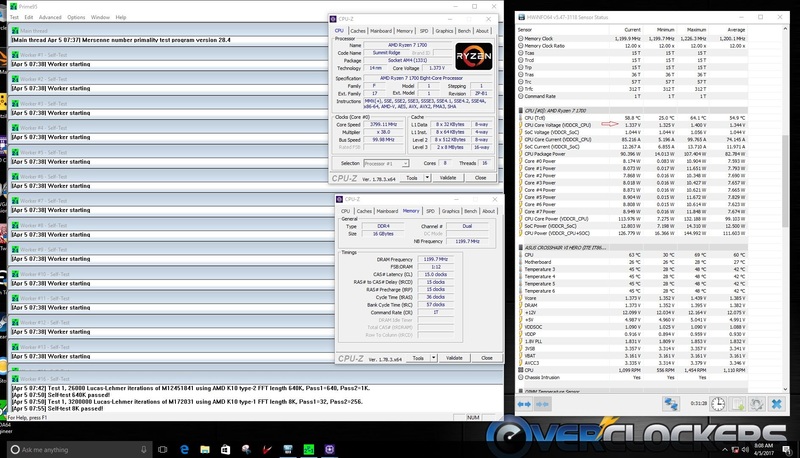 One great thing that AMD carried forward is that all Ryzen CPUs have unlocked multipliers, this alone makes life easier when it comes to overclocking. The guide will be split into sections describing the Ryzen CPU itself, the tools you’ll need to get a proper OC, and different approaches to attaining the final results. It is important to note that maximum clock speeds are very dependent on many factors: processor, motherboard, and cooling method all play a large part in the final results and even with the exact same parts your results will vary. 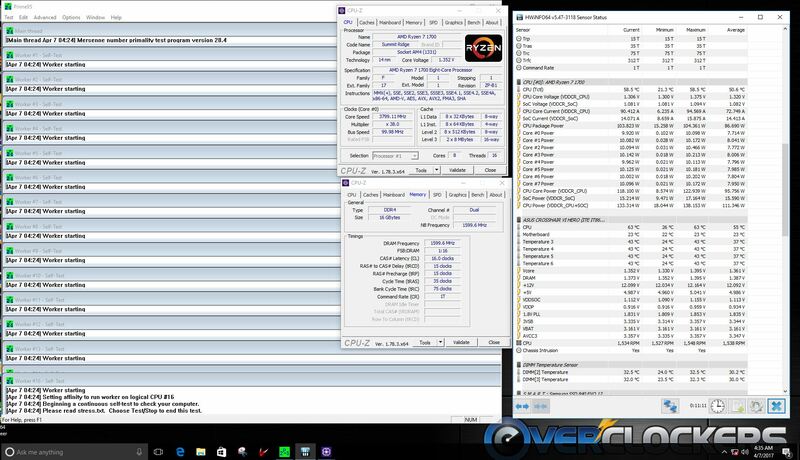 This CPU is a brand new microarchicture from AMD which includes some firsts for them. With their partner Global Foundries they managed a huge process shrink from 32 ƞm to 14 ƞm. They have also integrated much of the IO functionality into the die, similar to the past when they integrated the memory controller. On top of that, it’s their first foray into DDR4. For more details on the CPUs check out our review of the AMD Ryzen 7 1800x as well as the Ryzen 7 1700x/1700 and Ryzen 5 1600X/1500X reviews. Before we see how all this comes together I have a few words from AMD to help explain the Ryzen CPU’s normal and overclocked operation. The frequency of processor core clock is determined by a combination of the software requested p-state and then adjusted by a combination of numerous power and performance optimizing features to attain any of number of fine grain p-states around that software-requested p-state. Internal control mechanisms measure internal temperatures, power and current consumption, and manage the operating voltage and frequency of various internal cores to maintain specified levels. For example, when the number of active cores is below a pre-determined threshold, the active core temperatures are below maximum, and the consumed total current is below infrastructure limits, then those active cores will be boosted in voltage and frequency to the c-state “boost” frequency until any of those conditions are no longer true. The voltages for some of the various cores are internally generated from external supplies. For example, each of the processor cores uses a supply independently generated from the external supply. As the operating frequency for each processor core is adjusted to attain various fine grain p-states, the operating voltage of the core is adjusted to support that new frequency at optimal power consumption. The voltage adjustments are done using the internal voltage regulator and the SVI2-controlled external supply voltage, if needed. Software requested p-state or halt states adjust the level of power to which those internal control mechanisms manage. For example, when software executes a HALT instruction on a processor core, that core will enter the C1 reduced-power state. If that core does not receive an interrupt to resume execution, it will progress to increasingly-lower power states until finally saving the state of the core and being powered off. The internal memory controller and various other data paths will be initialized to the highest common operating frequency of any of the memory DIMMs present in the system and with memory timing parameters obtained from the DIMM resident SPD ROMs. A fundamental assumption of the normal operation of the AMD Ryzen processor is that the surrounding system current delivery and cooling capabilities are designed to the specified levels. The complicated operation described above manages the overall AMD Ryzen processor operation to maintain those specified capabilities. But what can be done if the system provides more current and cooling than those required for normal operation? All enabled CPU cores operate at the newly user-programmed voltage and P0 frequency value. Adjustment of the CPU clock is in 25 MHz steps. Internal features of the processor which control the CPU operating voltage and frequency to manage the CPU temperature, current consumption, and power consumption to specified maximums are disabled so that no additional stress to system voltage regulators and thermals are induced. This includes c-state boost. CPU low power c-states (CC1, CC6, and PC6) and software visible p-states (P1 and P2) remain operational and may be requested by software so that power savings can be achieved. The P1 and P2 p-state tables may also be modified to adjust the voltage and frequency of the CPU when running in software-requested, reduced-performance states. These may also be left at stock values. If the OS-level software power policy is also changed so that the CPU’s power-saving p-states are not used (for example: High Performance mode in Windows), then these power-saving states will never be requested. 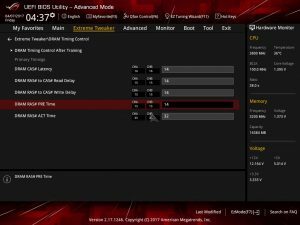 If AMD Cool’N’Quiet is disabled, then low power c-states will also be disabled. Various internal voltage regulators supplying CPU core power are placed into bypass mode, allowing the external VDDCR_CPU to directly supply the CPU cores. CCX Core Complex where more than one core shares L3 resources. Before we get started I need to post the disclaimer straight from AMD. You’ll see this same warning when you open the AMD Ryzen Master overclocking utility and must click on agree to continue. 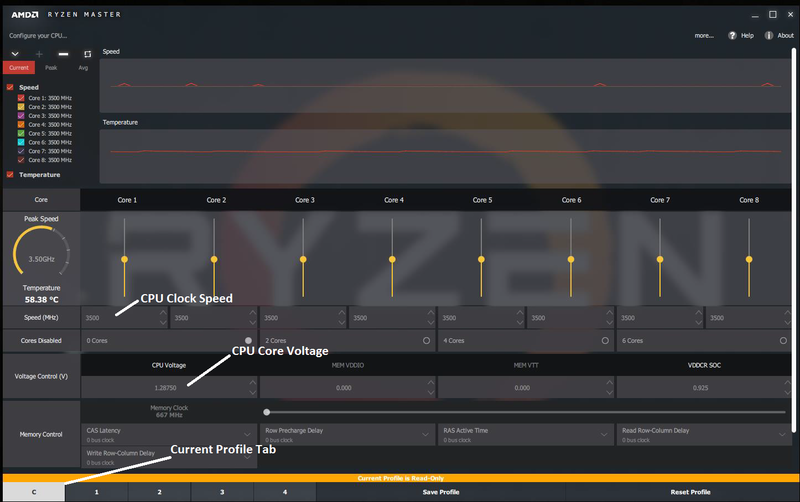 The CPU core clock is by far the most important performance tuning knob available on the AMD Ryzen processor. 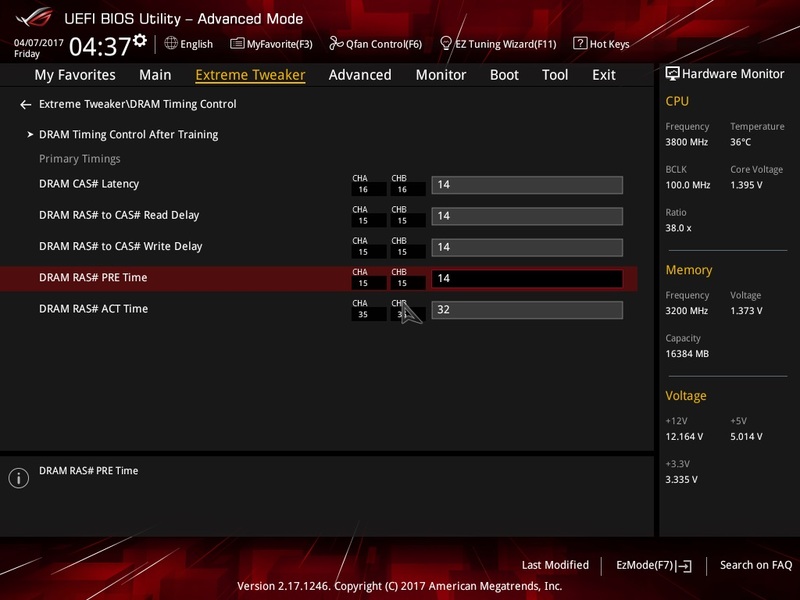 The following example shows the necessary steps for CPU overclocking using AMD Ryzen Master. In the below example AMD Ryzen Master has been launched while the CPU is running at the given core clock speed and CPU voltage. AMD Ryzen Master opens the Current profile (“C” profile tab in the lower left corner of the UI). 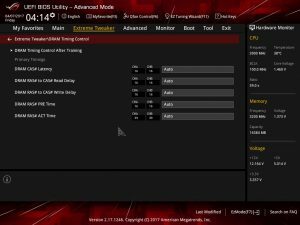 The Current profile reflects the current CPU settings from boot or as applied from an AMD Ryzen Master profile; it is read-only and does not directly allow user adjustments. The values can be adjusted by selecting one of the four user-editable profiles (1 to 4). In the below example Profile 1 has been selected. To Overclock the CPU the user needs to adjust the CPU clock. dragging the yellow dot in the clock slider. by typing in the desired CPU clock in the text box. by clicking the up and down buttons with mouse. by clicking the Speed text box (left mouse button) and then dialing in the desired value using keyboard up/down button. by activating the text box and adjusting the value with mouse scroll wheel. The CPU clock can be adjusted in 25 MHz steps. 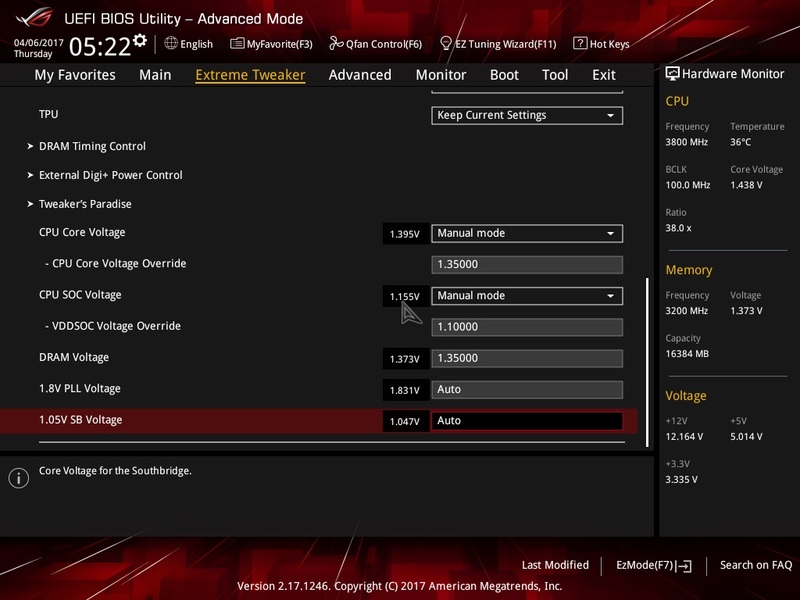 CPU Voltage can be adjusted by typing in a new value in the CPU VID text box. The example below uses a value of 1.40 V. The CPU voltage can be adjusted in 0.00625 V steps. Note: Some motherboards may apply a voltage offset from the BIOS. In this case the actual CPU voltage may be higher (or lower) than what the CPU VID value suggests. It’s always a good idea to monitor the actual voltage level (from the BIOS or with the motherboard vendors monitoring application). Caution: Raising the CPU Voltage above the stock setting is the single-most contributing factor to reduced life of the processor and/or damage due to transistor over-stress and temperature. Each individual CPU unit may respond to changes in CPU Voltage differently. The settings are not applied until the user clicks the “Apply” button in the upper right corner of the UI. Clicking “Apply” will also automatically save the settings to the active profile. Note: Under overclocking mode all CPU Cores will operate at the same frequency and voltage. 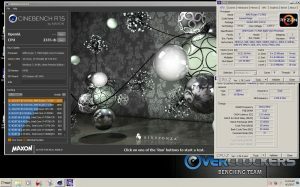 It’s a good idea to verify the performance increase and stability by running CPU performance benchmark(s) and stability tests (example: Maxon’s CINEBENCH R15). Please close all background apps to ensure stable and consistent performance results run-to-run, but expect some variation. OK, let’s get this ball rolling. First thing I did was open the Ryzen Master utility, selected “profile 1”. Then I bumped up the core speed to 3300 MHz without any other changes just to check for any “odd” behavior. After this I did a quick stability test with Prime95 Blend to check temperatures and voltages to get a “baseline” for stability. Just a note here: all BIOS settings were at default, I’m relying solely on Ryzen Master for all changes to accommodate my overclock. Next on my list was memory changes. Normally, I would leave this to the end of my overclocking but I just wanted to see how it worked and IF it would work. In the memory control section you can alter a few of the main timings and also the speed of the RAM. The timings are changed by clicking on the small down arrow which brings up a drop down menu. You can scroll or use the slider to find the input you want, then select it and it will populate that section. Memory speed is altered with the slider. The slider will only stop on the memory strap such as DDR4 2666 MHz, 2933 MHz, or 3200 MHz. As you can see in the picture of the utility below the memory reads at its true speed, not DDR speed. So if it’s showing 1333 MHz in the utility, the DDR speed in Windows will be 2666 MHz. Any memory changes in the Ryzen Master Utility will require a reboot. I did the memory in two steps: First, I altered the timings and then rebooted. I’ve included a BIOS screenshot just to visualize what is going on there. It appears to have my stock timings of 14-17-17 but if you look to the left , those are the timings that I set in Ryzen Master and will also be reported as such in Windows after the system boots. After a successful boot Ryzen Master opened automatically because of the memory changes. 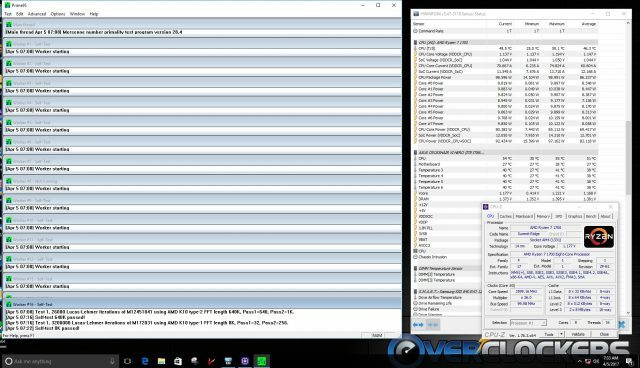 As it stands now, there is no way to have the utility automatically set your overclock at Windows start up, so you’ll need to do it manually. Then I tried changing the memory from 1333 MHz (2666) to 1467 MHz (2933), then successfully rebooted. 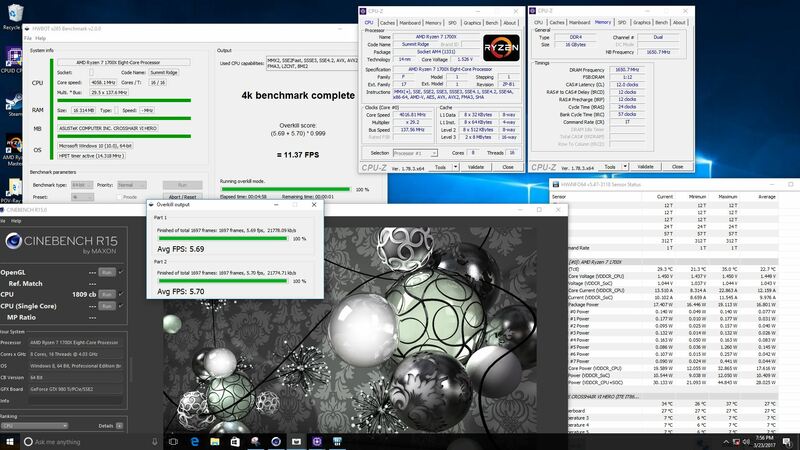 I did another Prime95 blend test at this point to check stability. I want to add here that I haven’t changed any voltages in the Ryzen Master utility or in BIOS. Now that I have the RAM out of my system let’s go for more speed. From 3300 MHz I started upping the Multiplier and going in 100 MHz jumps with stock voltages. I did a quick test stability test at each 100 MHz interval. At 3.6 GHz still on stock voltages, I had a thought: What will the system do if I set it to balanced? To my surprise, all the power saving features were still working. The system would cycle up to 3.6 GHz under load and idle at 1.5 GHz and reduced voltages. Seems like the best of both worlds to me. I know that if the multiplier is changed in the BIOS the CPU automatically goes into “OC” mode. This means that all the power savings and boost are disabled. Using Ryzen Master still kept the power savings active but there is no “Core Boost” that I could see. From here things slowed down a bit adjusting voltages and testing, had a few crashes along the way as well. This is all normal and I find that the voltage on the Ryzen scales fairly quickly at a certain point. For this CPU it was at 3.8 GHz. 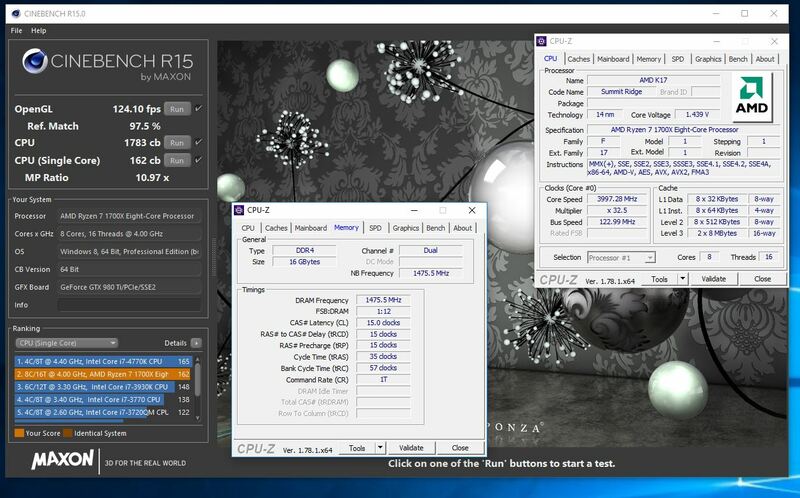 I managed a stable overclock at 3.8 GHz using 1.35 V for the CPU Core. Not too shabby really, considering the 3.0 GHz base clock. An 800 MHz increase in clock speed or roughly 25%. Now that I had reached AMD’s recommended “safe” voltage, I gave the memory one final push. I upped the speed to the last (3200 MHz) divider and loosened the timings to CL16-16-16-36 which will work on the RAM’s stock voltage of 1.35 V. It wasn’t quite stable at this speed and required a bit more voltage to the VDDR_SOC. This is one of the new voltages added with the Ryzen CPU and it can help with memory stability. Just a warning it really doesn’t need a lot of added voltage – the stock voltage on my board was 0.95 V and I only moved it up to 1.05 V. Something to keep in mind while you’re tinkering. So what does the memory speed gain me? In real life probably not a whole lot or something you would be able to perceive visually but I’m a bencher at heart and performance is my ultimate goal. So even if it’s just 10 more points in Cinebench R15 that’s enough for me to take the time to get it to work. Just to refresh memories I’m working with the ASUS ROG Crosshair VI Hero motherboard which features a multitude of options in the BIOS, many of which are aimed at the Extreme overclocker and the average user will never use but a few of them. At this point after doing the Ryzen Master overclock, I have a pretty good idea of what this CPU will do. So I cleared out all the settings from Ryzen Master and rebooted to BIOS. This time through I’ll do the overclock with all voltages on auto settings and only changing the multiplier: It was surprisingly easy. 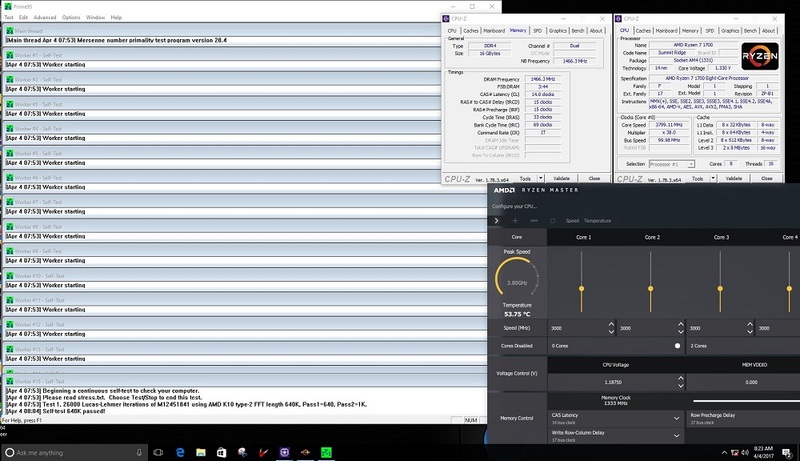 My first test was at 3600 MHz, I set the multiplier to x36 in BIOS and rebooted. 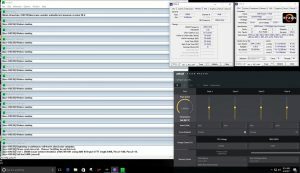 My RAM is still on auto and defaults to DDR4 2400 CL15. Here I just did a quick test to see if “auto” would supply enough voltages to keep it stable and it did. OK, so that passed a 25 minute Prime95 blend test which is good enough for relative stability in my books. Now let’s test to see if the BIOS will bump the voltage up high enough (or too high for that matter) to run at 3800 MHz. Another reboot to BIOS, set the x38 multiplier and reboot. The system fired right up and went straight to Windows without a hiccup. I started another Prime95 stability test and let this one run for 15 minutes. Now remember that the RAM is still at stock and as you can see in the picture below (marked with the red arrow) the core voltage is reaching it’s AMD recommended maximum of 1.35 V for 24/7 operation. I have to admit I’m impressed with the Crosshair’s capabilities here. It’s running the CPU stable and not over-volting it at all which is quite common when using auto settings. There’s only one problem, my RAM is still at DDR4 2400 which isn’t good enough for me. I have found on this platform it’s typically best to give the RAM smaller steps for training. This means I didn’t just set the RAM to DDR4 3200 but raised it one divider at a time and tested each with Prime95 for 15-20 minutes. 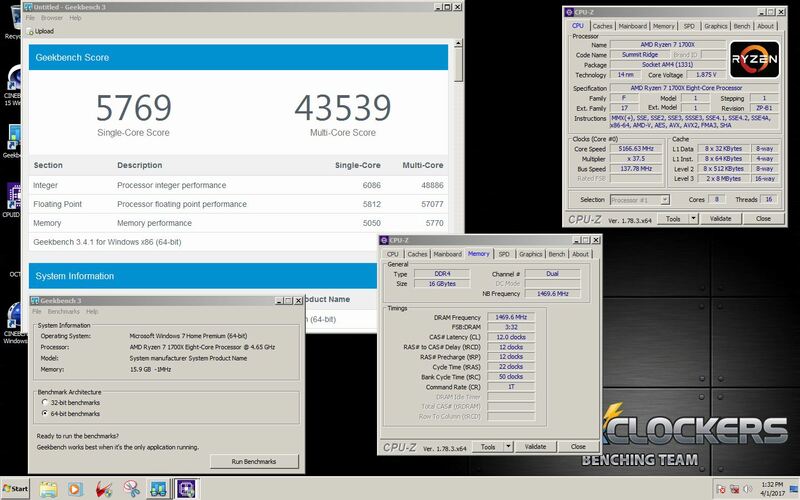 Eventually I worked my way up to DDR4 3200 with all timings on auto the BIOS set it at CL16. Prime95 stability test for 80 minutes to verify it’s stable. Possibly not 100% but good enough for my purposes here. As you can see in the picture above I have highlighted the “important” voltages for the next part which is inputting them into the BIOS in manual mode. This isn’t a necessary step and you could leave the system as is. Voltages are within spec and the CPU is running well under the MAX of 95°C where the motherboard will throttle. Even at that 95°C is too hot. I wouldn’t recommend running over 80°C myself for sustained loads. This is a new platform so longevity at higher temperatures and voltages is still widely unknown so I would try to stay withing AMD’s guidelines. Back to the voltages: You’ll see I have the V_Core, SOC and DIMM voltages highlighted. These are the ones I will transfer to BIOS. The SOC voltage isn’t going to transfer directly. I’ve had a fair amount of usage with the Ryzen CPUs and in my opinion the motherboard is setting it a bit high even for the DDR4 3200 memory setting. As you can see from the picture above I have input my voltages with a slightly reduced SOC voltage. To do this with the Core and SOC options you need to select the “Manual” setting from a drop down list that pops up when you click on that option. After selecting “Manual” the Voltage Override option will appear. After manually selecting voltages I rebooted into Windows and tested with Prime95 blend again. My first test lasted about 15 minutes before the system rebooted. I was greeted with a Q-code of “8”. This is the equivalent of the “00” code many will be familiar with. I hit the “retry” button on the Crosshair and was back to BIOS without issue. I then added a few ticks to the CPU Core voltage raising it to 1.3685 V and rebooted. 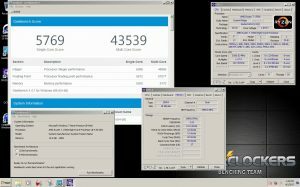 Back in Windows I started my Prime95 stability test again this time it ran for 50 minutes before I stopped the test, satisfied with my results. Now that we have our CPU speed down to 3.8 GHz, it’s time to work on the memory, some performance can be gained here and personally I can’t stand to leave that on the table. I must say that for most users this isn’t going to make a huge difference in your every day computing. You could easily stop here and still have a nice quick system. 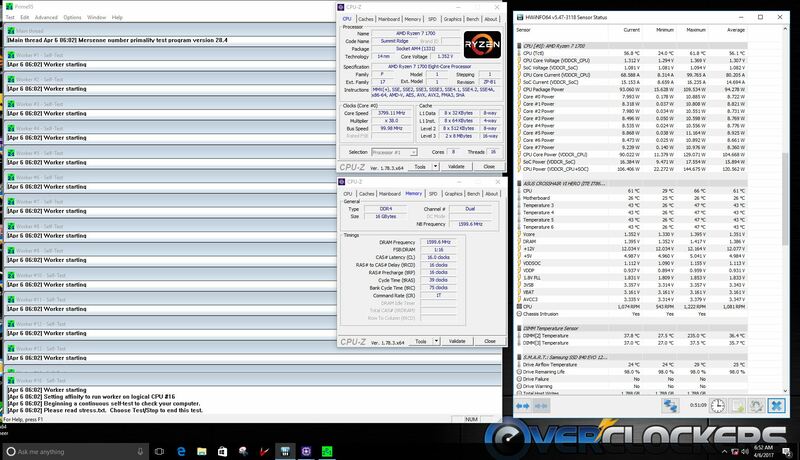 Memory overclocking can be a bit challenging and also corrupt your Windows installation, it’s up to you whether or not you feel it’s worth it to continue. 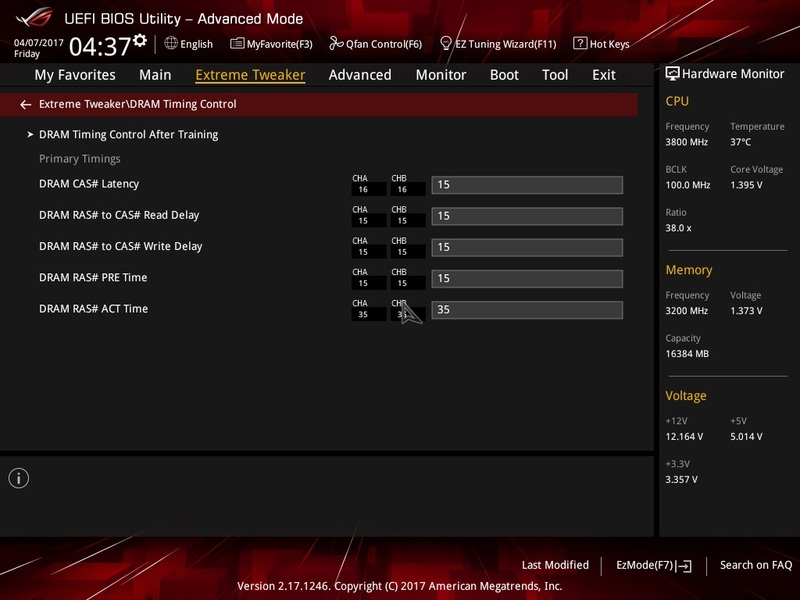 First thing, I went into BIOS found the DRAM timings section and changed the auto settings over to my CL15 timings as you can see in the pictures below. Next, save the BIOS settings and reboot into Windows. Everything went pretty smooth, no issues during start up and all other BIOS setting were left the same as the previous 3.8 GHz OC with DDR4 3200 MHz RAM. Prime95 is a fairly good stability test, when using the blend option on default it only uses about 2 GB of RAM. It’s also very customizable so this time before I started my Prime95 stability test I set it to use 8 GB of RAM to put further stress on the RAM and IMC (internal memory controller) than the normal blend test would. Then ran a short stability test to see if I needed any voltage adjustments before I reduced the timings any further. As you’ll see in the picture above, one of the “quirks” at present with the Ryzen CPU is it’s dislike of “odd” numbered CAS Latency settings when using a higher RAM divider. It has automatically changed my setting of “15” to “16”. I’m pretty familiar with my RAM and I know that I can get it to run at DDR4 3200 CL14 without too much issue, so one last trip to the BIOS. This time I did change the DRAM voltage from 1.35 V to 1.4 V just to give the RAM a bit more juice to help with stability. I won’t spend too much time on this section. Mostly since this option isn’t available on many motherboards and secondly it creates its own issues. Possible corruption of SATA drives being a big one. Also the fact that if the bus clock is raised it also affects the PCIe speeds. Personally, I haven’t experienced any corruption to my drives and the drop in PCIe speed isn’t that significant. Once the bus speed is increased beyond 105 MHz the PCIe drops from Gen3 (MAX 1032 MB/s) to Gen2 (MAX 724 MB/s) so depending on your setup and uses you will want to do a lot of testing to see how this may impact your normal usage. The biggest benefit I have found for using the base clock is for fine tuning memory. The Ryzen platform at present doesn’t allow many memory timings to be manually set, only the main timings. All sub-timings are based on which memory divider you use. So I can set my memory at DDR4 2933 using the 2933 divider OR I can set the memory at DDR4 2400 and use the base clock to raise the speed to DDR4 2933. Take a look at the two pictures below and you’ll see what I mean and what kind of a difference sub-timings can make. Picture #1 has a CL of 16 even though I had set 15 AMD “rounds up” to 16 because of using the 2933 divider. Also note the Bank Cycle Time (tRC) is 69. In the second pic using the 2400 divider with base clock adjustments I get CL15 and tRC 57. There will be more timings set differently but this is all CPUz shows. As you can see, having tighter sub-timings can be very beneficial. 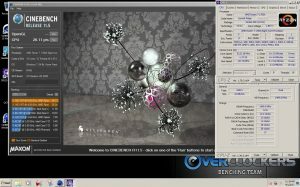 With the improved timings I gained nearly 20 points in Cinebench R15. Let’s just see if we can push this a bit further. Staying within the 1.45 V maximum CPU Core voltage that AMD recommends, I’ve tightened the RAM down and sped it up to DDR4 3300 with CL 12. You will notice that CPUz is misreading voltage. HWInfo64 reports 1.45 V and that was verified with a multi-meter. The VDDR_SOC was 1.05 V and VDIMM at 1.6 V both set manually in BIOS. 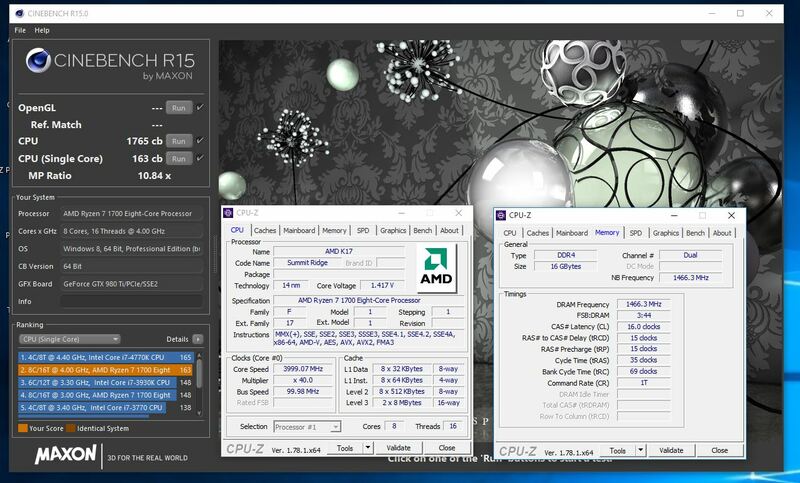 I’d like to start this by saying overclocking is quite unique to the system/CPU. Different motherboards, memory, and CPUs will yield different results. There really are no “plug and play” settings for all systems. This is a process that needs to be done slowly and methodically with a lot of testing along the way. This is really the only way to assure you have decent stability and won’t corrupt your operating system over time. One observation I have made is the majority of Ryzen 7 CPUs will run at 3.8 GHz with 1.35 V or less and the CPU “binning” appears to be quite parallel to the model. 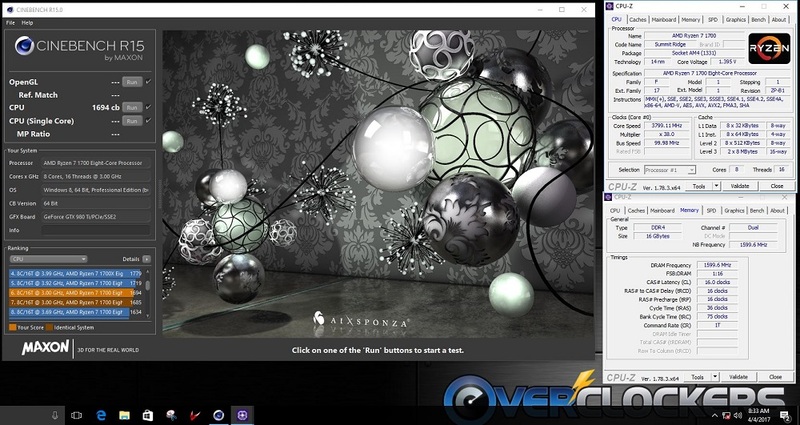 Meaning the best chance of the high Core clocks would be with the 1800x then the 1700x and finally the 1700. Now that doesn’t mean there aren’t Ryzen 7 1700 CPUs that will easily do 4.0 GHz at 1.35 V because there are but the odds are not in your favor. Realistically, you should expect to see 3.8-3.9 GHz for 24/7 operation on a Ryzen 7 1700. I would also like to mention the “voltage wall” since it’s very obvious on the Ryzen CPU that you are hitting one. 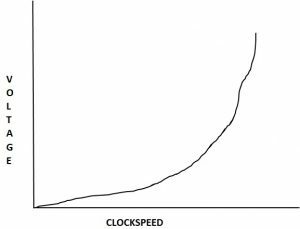 The reason it’s called a wall is that when visualized on a graph of voltage over clockspeed, there will be a steep climb where it needs large amounts of voltage for the increasing CPU speed. This steep climb is called the “wall”. 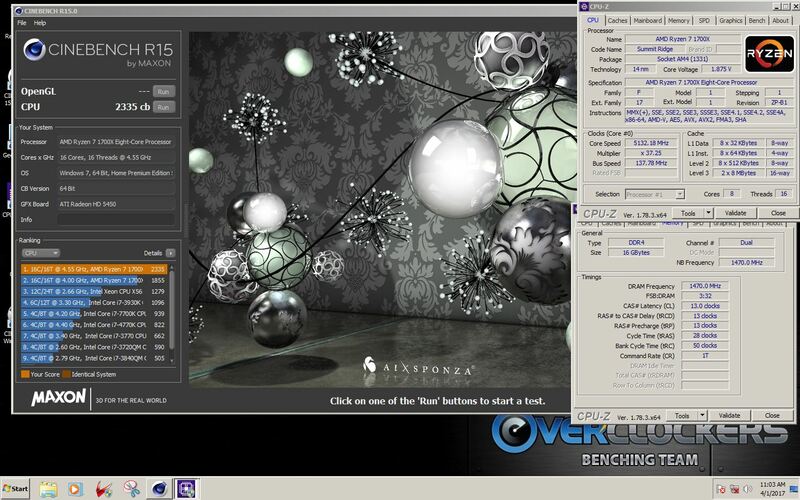 When overclocking my 1700 that “wall” started at 3750 MHz. At this clock speed I needed 1.23 V for the core. Just to get another 50 MHz required another 0.12 V and it only escalated from there. Temperatures can affect the “wall” but it only moves it a bit further up the CPI speed side. For me the difference between good air cooling and my custom loop was only about 100 MHz. On liquid nitrogen it moved to the 5.0 GHz range. I could bench at 5.0 GHz with 1.6 V, 5.05 GHz I was already over 1.7 V which is a huge jump. So as I said you’re going to see this behavior at some point and when you do you’re pretty much at the end of your overclocking journey. 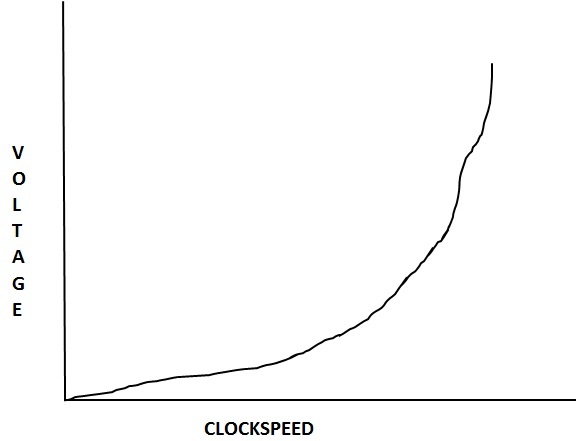 You can push past it but the speed gains versus the voltage used really aren’t worth it in my opinion. Core Voltage: This is going to be your main concern. 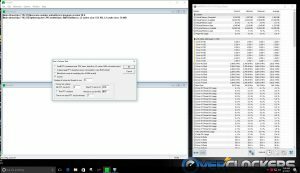 Raise core voltage for stabilizing the CPU also if you find you’re getting WHEA cache errors you’ll need to raise this voltage. The CPU core and cache are both fed from this rail, adding a bit more will stop the cache errors. AMD recommends 1.35 V for long term use. They also say that up to 1.45 V is acceptable but could affect the CPU’s longevity. In the end the choice is yours, personally I would split the difference and stay at 1.4 V or lower. SOC Voltage: In some BIOS such as MSI this is listed as NB voltage. Mostly needed for higher RAM speed stability. I wouldn’t recommend over 1.2 V for this rail at ambient. This should be plenty of voltage for any RAM. Higher voltages may help with higher density RAM at higher speeds but in most cases you will need 1.1 V or less. Same as core voltage above it is very CPU dependent. The RAM overclock you see above, I needed only 1.05 V for SOC but you might need more or you might need less. This is determined by your CPU. DRAM Voltage: In most cases this can be left at stock. For some motherboards with only basic settings DRAM voltage may need a bit over stock to help inconsistent booting. Setting it from 1.35 V to 1.4 V will help. When pushing DRAM speed or using lower timings you will also need to add voltage to keep the DIMMs stable. I have found no issues with running DDR4 at 1.6v long term but this is outside of specifications and does void your warranty. Do so at your own risk. MEMVTT: This option won’t be available on all motherboards but can help with the issue I mentioned above under DRAM. 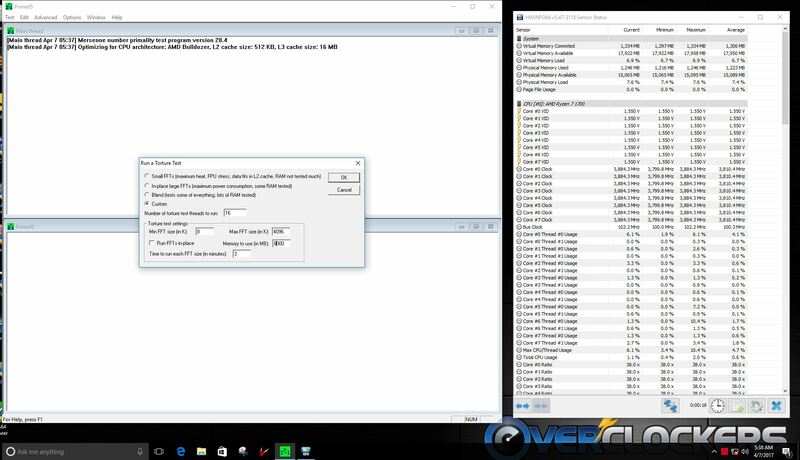 MEMVTT voltage affects the IMC, stock setting is always 1/2 of DRAM voltage. At times I have found that the system settings seem stable under stress testing but reboots can be iffy and will stop with a DRAM error code. Raising the VTT voltage slightly can help to overcome this boot issue. If DRAM voltage is 1.35 V then VTT auto setting is 0.675 V. Raising this to 0.7 V will usually clear up the RAM related boot issue. That pretty much covers all voltages you will need for an average overclock of the Ryzen CPU. If you have any questions feel free to ask in the comments section at the end of this guide and myself or one of our other members will be happy to help. I won’t spend much time on this but I do want to touch on the subject. This is my hobby and it’s not for everyone. It’s taken me years to get to where I am now and I would suggest to anyone with an interest to take your time and learn the ropes before attempting to freeze a CPU with liquid nitrogen. My journey started with a few years of building my own systems and overclocking them mildly to improve my gaming. I stumbled in to the Overclockers.com forums one day with an overheating issue and I just stayed. 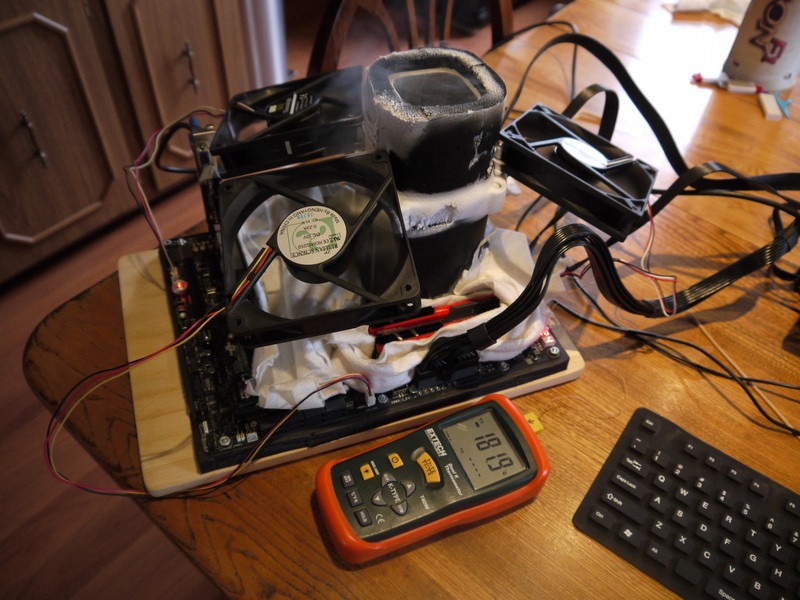 Overclocking had always fascinated me and I always seemed to want more than my system or cooling were going to give me. This was even further aggravated by the Overclocktagon. This is our site’s internal benchmarking competition, open to all members. A place to try out all your hardware and see how fast you can make it go. It’s friendly competition and a great learning experience. Starting in September with the cooler weather we have four months of CPU benchmarks followed by four months of 3D benchmarks. This consists of a different benchmark each month. As I said, it’s all for fun but I soon found it kind of addicting. That’s when I decided I need to get my CPUs colder so I can run them faster. My first adventure was ice water in a chest cooler with a pump and water block. I found out very quickly what condensation can do with electronics when my system just shut down. I was lucky and nothing was seriously damaged but that’s not always the case. I have grown a lot since that day and doing this is second nature to me now. Here’s some examples of what can be accomplished with liquid nitrogen. As I mentioned this isn’t something you want to try without some research and a bit of background first. It’s not really that hard to do but takes some patience and a lot of attention to detail. 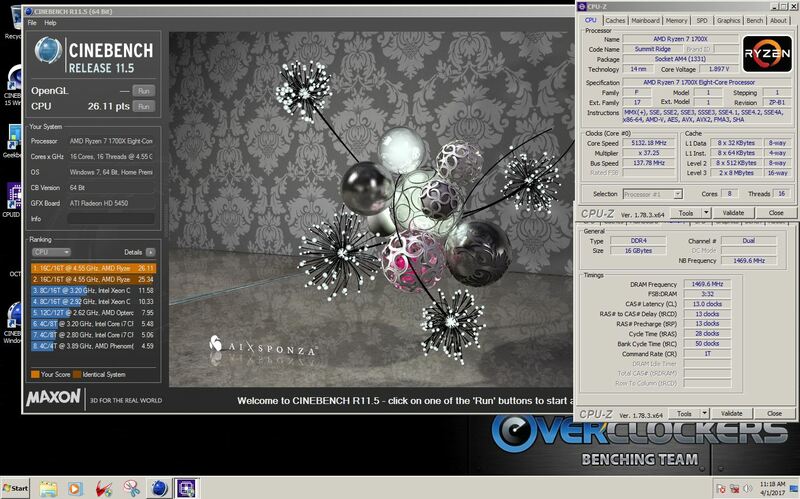 If this is something that interests you come by and pay a visit to Overclockers.com’s Competitive Benchmarking Team. Thanks for the write-up Johan! How can these Ryzen compare clock for clock with current intel perf per mhz? I ask because im seeing excitement at 3.8ghz which i can only assume is because of some serious performance per clock gains ..
considering intels been near 4.8-5ghz on good air/water cooling for a while now. They are slightly under Intel as far as IPC goes. They are limited on the OC side, but overall, leaps and bounds better than the FXs. With AMD's flair for multi threading, apparently. Their FX chips were pretty decent in that arena but Ryzen looks to be a beast. Their FX chips were pretty decent in that arena but Ryzen looks to be a beast. I have an AMD FX-8305 cpu, which runs decently enough for the price. My only issue is that it runs way too hot for my liking. Upgrading to the Ryzen soon enough. They have put a lot of execution resource in Ryzen cores, with the notable exception of AVX2. With the caution "it depends on the task", in general a single Ryzen core can have more potential than a modern Intel one, but it is not usable by a single thread. 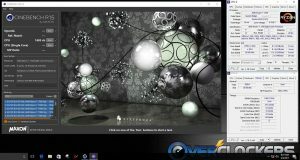 If you run two threads on one core, Ryzen can pull ahead. I can't seem to adjust my memory clock in ryzen master. It's grayed out. Not sure if it's my computer cause im using dell 15675 computer. It wouldn't surprise me that the memory is locked in BIOS. Ryzen had issues with memory at launch and still does with certain types. DELL would want to keep control on that so your PC would stay stable. Can I unlock thru the bios? 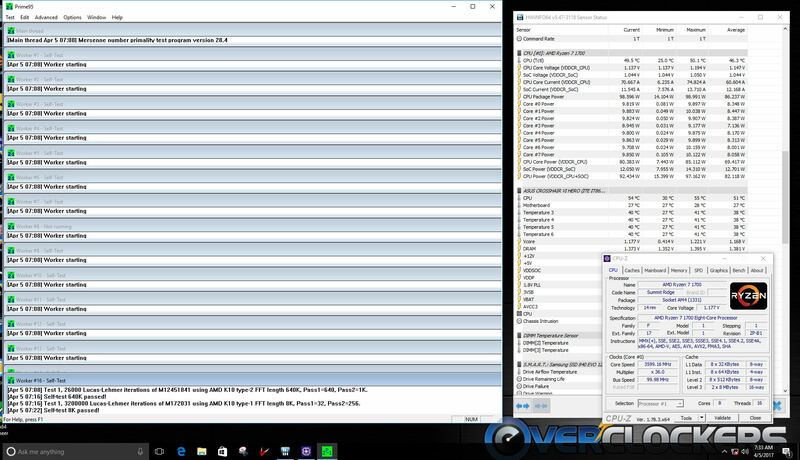 I concur with Johan, it's doubtful you will have any control of overclocking CPU or RAM on an OEM pc, most BIOS are locked on OEM Pc's.